This entry was posted on September 4, 2018 by Herb. 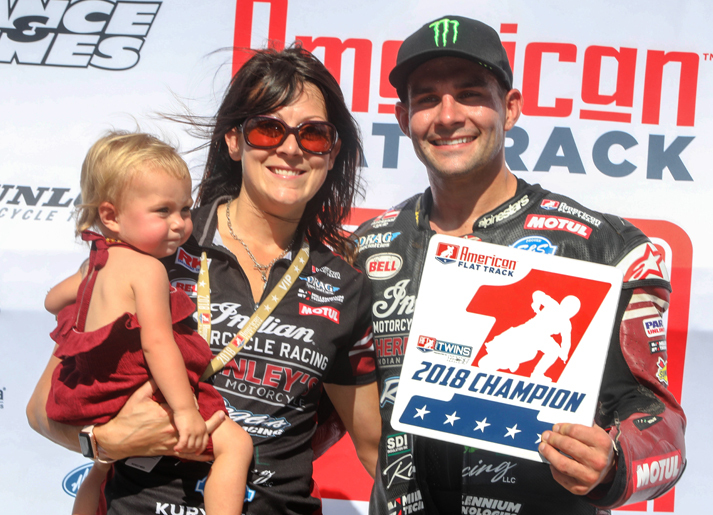 Mees was still a winner, however, as his runner-up finish secured his fifth AFT Twins presented by Vance & Hines championship. His 10 wins and victories in four of the five Miles in 2018 – plus his 40 Grand National Championship victories, fourth all time – make him a legitimate giant in the sport. Smith's win, which featured a fierce back-and-forth battle between four of AFT’s top riders for the majority of the 25-lap race, was his first in sixteen months (he won the May, 2017 Springfield Mile) but his ninth at the legendary Illinois venue. "That was a pretty classic Springfield mile," Mees said afterward. "Honestly, my game plan was to lead it off of four. I felt like I could beat them to the line… but I couldn"t. We were so close. I wouldn’t have done anything differently, honestly. We came up a little short, but we got the main goal, the championship. My team worked so hard. It’s an honor, and I’m looking forward to the next three races." Third went to Springfield Mile I winner Jeffrey Carver Jr., who after an electrical gremlin nixed his chances in his Heat had to start from the back row in his Semi. It didn’t matter much, as he got to the front quickly and was barely beaten at the line by Semi winner Mees, which gave Carver Jr. a front row starting position for the Main. The fourth rider in that lead pack, which had gapped fifth place finisher Henry Wiles and the rest of the field by several seconds by the race’s mid-point, was Briar Bauman. 3 ... Jeffrey Carver Jr.